Something extra: Arrange your own private dinner or wine-tasting in the Wine Cellar! Ask our sommelier or concierge for details. Take in the fresh breeze at an outdoor table in Windows Café, our casual buffet offering made-to-order breakfasts and a large variety of lunch and dinner options. Choices change daily and include fresh sushi, stir-fries and pastas, salads, smoked lox and other cold fish, a carving station and sumptuous desserts. There’s more: Don’t miss the buffets! Indian, Mexican, Spanish, Italian, and other regional cuisine. Our international crew takes pride in their native cuisine and it shows. There’s more: Don’t miss the famous pool deck parties, when servers may include a few friendly officers. These parties are legendary for great food, music and conviviality. With advance notice, we can accommodate most special dietary needs. Please submit your request in writing to our Access Department no later than 40 days before US sailings, and 80 days before all other sailings. Fax requests to 954.628.9622 or e-mail to: [email protected] Standard kosher-style menus are available on all voyages. On the day of boarding, please confirm your special dietary arrangements with the restaurant manager. In all of our dining rooms, we encourage guests to follow a “resort casual” dress code, following good taste and common sense. Bare feet, tank tops, baseball caps, bathing suits, shorts, and jeans are not allowed in the main dining room or two specialty restaurants. (Khakis and other trousers are fine.) When dining at Windows Café, guests must wear footwear and a cover-up or shirt. In Prime C, Aqualina and Discoveries Restaurant, many guests enjoying dressing up. Formal evening wear (tuxedos and gowns) is not expected. We recommend that men bring a sport coat or suit; this attire comes in handy for evenings onshore as well. For women, dining attire includes dresses, skirts, blouses with pants and capris, and other appropriate attire. At time of booking, Carnival guests will be able to confirm their preferred dining choice. If their preference is not available, they may confirm an alternate choice and be waitlisted for their preferred choice. Waitlists will be cleared prior to the sailing and guests will be notified by email. Parties traveling together who are waitlisted will be cleared for the same dining time. Lunch and dinner are also available bistro-style on the Lido Deck. Spirit-class, Conquest-class, Carnival Splendor as well as the Dream-class ships have the added convenience of a reservations-recommended steakhouse (nominal $30 fee per person will apply). By popular request, all dining rooms are now smoke-free. For breakfast and lunch, the main dining rooms are organized as "open seating," where you may come and go as you please during the set hours and are not obligated to sit at your assigned table. Breakfast times vary by ship; the times above are provided as a general guideline. Please check your daily Capers for exact times. You can also enjoy a continental breakfast in your stateroom until 10:00 AM or a limited breakfast menu on deck. *Prefer a little flexibility? No reservations required. Your Time dining allows you to dine in the main dining room, at your leisure, anytime between 5:45 p.m. and 9:30 p.m. Guests are seated first-come, first-serve, depending on party size. In most cases, guests are accommodated within 20 minutes. However, pagers are provided if all tables are occupied so guests can relax elsewhere on the ship until their table is ready. Due to the limited number of large table availability, parties with greater than 10 guests may need to be accommodated at different tables. Dining times are subject to change. The Main Restaurant is the centerpiece of our immersive and enriching range of culinary experiences. We're proud to present an unparalleled wealth of choices every evening. Working literally around the clock, the galleys delight in sending out artfully presented dishes, every delicate micro-green garnish perfectly in place. And, now, starting with Celebrity Reflection and soon coming to the entire fleet, more than 60 SPE-certified options for healthy and delicious dining. Celebrity was one of the first cruise lines to offer a spa restaurant. We saw an opportunity to create an extension of our industry's leading spa experience by introducing the AquaSpa Café. The result is a creative take on healthy cuisine, featuring an eclectic blend of offerings that are both flavorful and good for you. Celebrity has transported a collection of the world's finest restaurants to sea. Specialty Dining aboard a Celebrity cruise will take you to new gastronomic heights, with five-star service and a chic, sophisticated ambience. The SS United States Restaurant features original, etched glass panels salvaged from the liner during her decommissioning. In addition, you will find other memorabilia from the SS United States throughout the restaurant, including a full-scale model of the great liner and original china and menus from her time in service. Impeccable service, classic design, world-class cuisine and comfortable sophistication are celebrated to the utmost in The Normandie. Surrounded by the original paneling and ornamentation from the celebrated SS Normandie, you'll experience world-class cuisine presented and finished at your tableside. Our Ocean Liners Restaurant is a celebration of that luxurious era of transatlantic crossings. The walls are lined with paintings of the SS Ile de France and other notable ships, and glass showcases of marine memorabilia capture the mystique of a bygone era. Relive the age of post-World War I jubilance and glamorous innovation as you enjoy Rack of Lamb Encroute with a vintage glass of Burgundy in these magnificent surroundings. Impeccable service, classic design, world-class cuisine and comfortable sophistication are celebrated to the utmost in the Olympic Restaurant, the fine dining restaurant. Dine at one ship inside of another. 'Old Reliable' becomes your new décor for this restaurant featuring original paneling from the historic RMS Olympic. Meet our newest restaurant, available only on Celebrity SilhouetteSM and Celebrity ReflectionSM. The bright and modern Lawn Club Grill celebrates the flavorful joys of outdoor grilling. The highlight of dining at the Lawn Club Grill is the opportunity to serve as your party's "Grill Master," by being paired with a Celebrity chef to assist in preparing the menu for your table over custom-built, ventilated grills. Relax and gaze out over the cool, green grass of The Lawn Club, or the cool, blue sea, while savoring just-made fare for breakfast or lunch. Featuring quick, simple and fresh food, like soup, salads and panini. Open for breakfast and lunch. Reservations are not required for this restaurant. Note: T-shirts, swimsuits, robes, bare feet, tank tops, baseball caps and pool wear are not allowed in the main restaurant or specialty restaurant at any time. Shorts and flip flops are not allowed in the evening hours. As a courtesy to our guests, we respectfully require and enforce compliance with dress code at the entrance of your restaurant of choice. Additionally, guests are asked to follow the 'Smart Casual and Above: dress code in the Celebrity Theater for all evening performances. Gentlemen: Tuxedo, suit or dinner jacket with slacks. The dress code at Celebrity's Specialty Restaurants is 'Smart Casual and Above' for every night of your cruise. Formal attire is only required in the main dining room on your formal evenings. Formal evenings call for formal attire. Men can arrange for tailored, elegant formalwear to be delivered directly to your stateroom. To order, visit Cruiseline Formalwear. All meals are served in your ship’s Main Dining Room, with a choice of a table d'hôte (set menu) or a buffet, or in the enclosed dining hall on the pool deck for casual meals. You will also find buffets near the pool serving pizzas, burgers, hot dogs, Greek specialties and fresh pasta dishes, among other satisfying menu items. Lunch and dinner service varies depending on the day’s itinerary; the meals are also timed to accommodate those passengers who are on one a Shore Excursion or who have signed up for one later in the day. The Daily Program, which is delivered to your cabin each evening, includes the dining room schedule for the following day. Depending on the schedule, you can select when and where you enjoy each meal. Reservations are not required for breakfast and lunch or dinner, which are open seating, as is the open deck buffet (weather permitting). 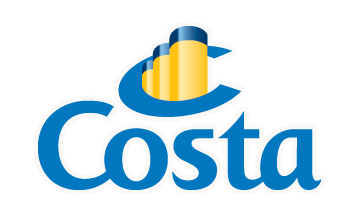 Costa offers all kinds of dining options, so you can eat formally or casually, in the open air, in a restaurant or in your stateroom - any time of day or night! Dining choices abound from poolside dining to midnight buffets. Each day you may choose to dine Casual at the buffet, Traditional in the main restaurant or in one of world-class Specialty restaurants (additional charge applies). Cozy bistros serve pizza, gelato, cappuccino and espresso and room service awaits your call 24 hours a day. "Trattoria Italiana" - Casual Dining in the buffet or by the pool deck. "Tradizionale" - Traditional Dining in the main restaurant. "Salute e Benessere" ~-Spa Menu for the health conscious. "Dining di Lusso" - Deluxe Dining in one of Costa's specialty restaurants. "Piccolo Morso" - A Lite Bite from the buffet or room service 24 hours a day. "Pizzeria" - Pizza in the bistro. "Spuntino" - Treats to Sweets from the midnight buffet. Freshness and innovation are the hallmarks of the Crystal dining experience. From your choice of dining times in the Crystal Dining Room to lavish themed buffets on deck or intimate experiences in our specialty restaurants, you'll find an ambiance and cuisine to suit your every mood. The classic Crystal Dining Room or the intimate Vintage Room. The striking Sushi Bar or the delicious comfort of a meal served in-Suite/in-stateroom. From the extraordinary cuisine of celebrity chefs and legendary restaurateurs such as Nobu Matsuhisa and Piero Selvaggio to the inventive menus created by Crystal’s own acclaimed culinary team, dining aboard Crystal Serenity and Crystal Symphony promises to delight and surprise even the most discriminating palate. The menu offers an extensive selection of regionally inspired cuisine prepared in the classical French tradition. The array of tantalizing options includes our “Lighter Fare” low-sodium, low-cholesterol and low-carb selections, plus vegetarian offerings. The Crystal Dining Room offers open seating for breakfast and lunch; with our Perfect Choice Dining options for dinner, you may select from Classic Main (beginning at 6:15 pm), or Classic Late (beginning at 8:30 pm). You may also choose our Dining by Reservation option (available between 6:15 pm and 9:15 pm). Actual times vary by itinerary and are printed in Reflections on board. With Dining by Reservation, you have the flexibility to choose with whom you wish to dine as well as your dinner time (within the applicable dining hours). If you choose Dining by Reservation, you may reserve your dining times through our Priority Check-in & Planning Center prior to your cruise, or you may make these arrangements once on board. All dinner reservations are subject to availability, and every effort is made to honor requests. You can now savor your travels and experience culinary excellence with Crystal’s Perfect Choice Dining.TM Enjoy the ultimate dining experience with Crystal, the only luxury cruise line to offer the choices of Classic Main and Late Seating, or Dining by Reservation.TM Perfect Choice Dining is our newest way of inviting you to write your own personal definition of luxury. Crystal Cruises has perfected the art of dining at sea. With an emphasis on variety and flexibility, the cruise line voted World’s Best more than any other cruise line in history presents Perfect Choice Dining, a unique concept offered in the Crystal Dining Room which allows you to choose Classic Main or Late seating, or our newly introduced Dining by Reservation. With Dining by Reservation, you are able to reserve a table in the Crystal Dining Room each night of your voyage, if you wish. Offered in addition to Crystal’s Classic Main and Late seatings, the complimentary Dining by Reservation is an ideal option for those who wish to linger a little longer ashore, indulge in a late afternoon spa appointment or simply enjoy the early hours of evening at your leisure. Our Dining by Reservation may be selected at the time of booking. Once your cruise is fully paid, you may then reserve your personal dining times at our Priority Check-in & Planning Center. A different time, a different table, just for two or with newfound friends, Dining by Reservation affords you ultimate freedom. The extraordinary cuisine for which Crystal is renowned is served in the stylishly sophisticated Crystal Dining Room. Inventive menus showcase the unique flavors of the world with regionally inspired dishes presented alongside classic continental favorites. Gracious European-trained waiters anticipate your every desire, while expert sommeliers share passionate insight on the most comprehensive wine cellars at sea. By day, sunlight bounces off the ocean waters through expansive floor-to-ceiling windows to dance across tables set with Schott Zwiesel crystal, Villeroy & Boch china, Sambonet and Elkington silver, and Frette or Garnier linens. Evenings are equally as magical, with the sounds of our musical trio serenading the room under the twinkle of crystal chandeliers. Here you revel in the day’s adventures with stories of discovery shared with newfound friends. Many traditional cruisers prefer classic dining options that allow them to eat at the same time each evening of their cruise, at the same table with their regular tablemates and served by their familiar evening wait staff. The elegant Crystal Dining Room, also serving breakfast and lunch (both open seating), sets the stage for this popular dining option offering diverse menus that blend the unique flavors of the world together with timehonored classics. For those who want more flexibility in their evening dining options, guests may now enjoy the same extraordinary cuisine and excellent service of our Crystal Dining Room, but with the added convenience of dining by reservation at a time that works with your schedule—just like at our specialty restaurants, or a favorite restaurant back home. Dining by Reservation is offered in addition to Classic Main and Late seatings. Crystal Cruises provides alternative specialty restaurants to enhance the evening dining options and provide the opportunity to enjoy a variety of culinary environments. Charming and romantic, Prego brings the flavors of Italy to Crystal Symphony and Crystal Serenity. A seasonally changing Valentino at Prego menu features signature dishes such as Scaloppine Di Vitello Servite Con Capelli D’angelo andLinguine Con Aragosta E Zucchini, along with wines that are served at Piero Selvaggio’s revered Los Angeles and Las Vegas restaurants, Valentino. Valentino is considered by many to be among the finest Italian restaurants in the country. The eclectic–and delectable–cuisine of world-renowned master chef Nobuyuki “Nobu” Matsuhisa is prepared by Nobu-trained chefs at Silk Road and The Sushi Bar. Regarded for his innovative approach to sushi, Nobu blends classically styled Japanese foods with distinct Peruvian and European influences. While The Sushi Bar offers an assortment of Nobu’s inventive sushi and sashimi, including Salmon Tartar, Tiradito Nobu-style and Yellowtail Sashimi with Jalapeño, Silk Road presents his celebrated dishes such as Lobster with Truffle-Yuzu Sauce, Grilled Wagyu Beef Rib-Eye with Wasabi Pepper Sauce, and his signature dessert, a Bento Box filled with Chocolate Soufflé Cake with Shiso Syrup and Sesame Ice Cream. The famed chef enjoys a long history with Crystal and unveiled his own line of fine china during Crystal Serenity’s inaugural season. Serving dinner only. An innovative concept in wining and dining is offered aboard Crystal Cruises. The Vintage Room promotes wine education and the vast range of fine wines available on board. In addition to tastings and discussions in this beautiful room, guests may partake in a variety of private wine-themed dinners by special arrangement with the Head Sommelier. To pre-reserve a seating or private dinner, please visit our Priority Check-in & Planning Center. Please note that the date of your Vintage Room dinner will be determined closer to sailing date as a minimum of 10 guests must confirm participation for the event to be offered. Serving dinner only. Crystal’s Ultimate Vintage Room Dinners are one-of-a-kind culinary experiences featuring some of the rarest wines in the world. Offered a few times each year on both Crystal Serenity and Crystal Symphony, depending on the wines selected the exceptional dinners are priced at an estimated $1,000 per person. The first Ultimate Vintage Room Dinner was an eight-course French meal prepared by Master Chef André Soltner, former chef/owner of world-famous Lutèce, paired with, among others, a nearly impossible-to-get 1959 Château Lafite–Rothschild, Pauillac, Bordeaux and a Screaming Eagle 1996 from Napa Valley, considered its dream year. This is a buffet-style, indoor/outdoor venue for breakfast and lunch. Breakfast includes made-to-order omelettes, waffles and pancakes to your liking, in addition to a large selection of other breakfast favorites. Lunch offers made-to-order pastas and salads, a delicious selection of our famous soups, carved meats, fresh catches of the day and a tempting array of sumptuous desserts, including sugar-free options. We also feature our award-winning special buffets which transform the poolside deck and Lido Café into another culinary world. Asia Café offers an enticing selection of dishes from all corners of the Orient. The American Classic features U.S. homestyle cooking. Cuisine of the Sun or Nuevo Latino buffets offer classic cuisine from the sun-drenched areas in which the ship travels. This popular Parisian-style coffee bar and café is a favorite meeting place open every day from 9am to 11pm. Complimentary espresso, caffe latte, cappuccino and specialty teas are served in our comfortable café, graced by the whimsical paintings of celebrated artist Guy Buffet. The Trident Grill offers classic hamburgers, cheeseburgers, veggie burgers, chicken burgers, hot dogs and tuna melts. There are also wrap sandwiches and gourmet pizzas (available at Tastes on Crystal Serenity). A Late-Risers Breakfast is available around the Neptune Pool (Crystal Serenity). The Ice Cream Bar features a wide variety of ice creams, nonfat frozen yogurt and sherbets, with tempting toppings, and fresh baked cookies. A special event at Crystal Cruises, each afternoon tea service presents a selection of savories and sweets served in the sunlit charm of Palm Court. Our Mozart Tea is a visit to 18th-century Vienna as you are greeted by staff dressed in velvets and brocades and are tempted by a selection of the finest cakes and pastries from Austria. Our English Colonial Tea offers a taste of tradition, complete with scones, finger sandwiches and assorted sweets. The American Tea is a Crystal Cruises creation, paying tribute to the classics of the American summertime. From breakfast in bed to dinner on your verandah, Crystal’s complimentary 24-hour in-stateroom dining is a true indulgence. At sea or in port, you may enjoy breakfast, lunch or dinner in the sumptuous comfort of your own room, served with the same precision and attention to detail so graciously displayed in every restaurant. During lunch and dinner hours, you are welcome to order the same selections offered in the Crystal Dining Room, served course by course, if you so desire. And if you’re traveling in a Penthouse, you may also enjoy the additional privilege of ordering from our specialty restaurants during dinner hours.Offered 24 hours a day, seven days a week. With some of the most exotic destinations and stunning coastlines in the world as a backdrop, lavishly arranged luncheon buffets take place on deck on select days at sea. Imagine cruising the Italian Riviera as you dine on the Mediterranean-themed Cuisines of the Sun, or the coast of New England as you enjoy the bounty of American Classic cuisine. Think Nuevo Latino celebrating the fiery gastronomy of South America, or an Asian Café showcasing flavors of the Pacific Rim. Regardless of where you travel, these events are always much more than a meal-they are true destinational events. Serving lunch on select days at sea. For breakfast, lunch and dinner, all dining venues including the Crystal Dining Room, specialty restaurants, Trident Bar & Grill, Lido Café and Tastes feature a three-course, low-carbohydrate menu. Always the innovator, Crystal was the first cruise line to implement trans-fat-free dining, added to our already numerous choices for healthy dining. A wide choice of pre-packaged kosher-certified meals, including meats, seafood and poultry as well as white and red kosher wines is available on a limited basis, on every itinerary. All chefs, kitchen and dining staff have been trained in kosher food preparation, handling and servicing. Only kosher pots, pans and utensils are used, and plates, silverware and glassware are washed separately. Due to limited provisioning resources, the number of guests per cruise who may partake in our kosher-style program is restricted to 20. Guests’ whose diet requires or who wish to dine kosher-style must provide us with advance notice at the time of the initial reservation, and no less than 90 days prior to sailing. We will do all that we can to ensure your needs are met. Due to limited availability, Kosher-style dining is subject to confirmation from Crystal Cruises. The intimate single seating Princess Grill restaurant with flawlessly attentive service and menus wonderfully combine different flavours, textures and ingredients to surpass expectations evening after evening. The Verandah, exclusive to QUEEN ELIZABETH, is her formal alternative dining venue and is your invitation to savour contemporary French cuisine that uses ingredients sourced in France along with an ambience that recalls the legendary Verandah Grill aboard the original Queen Elizabeth. Should you prefer a club sandwich or a light bite in the afternoon head for our Lido restaurant where buffet dining is available throughout the day. By evening it transforms into one of our regional venues: Asado is a South American Grill; Jasmine serves up exquisite Asian cuisine; while Aztec tempts you with interpretations of Mexican classics. During the day, casual attire is always appropriate throughout the ship. Evenings on all voyages are designated either Formal, Semi-Formal or Elegant Casual with dress suggestions listed in the ship's Daily Programme. Formal nights are among the most unique and exciting moments of many voyages — an all-too-rare opportunity to dress to the nines as you celebrate a Royal Nights themed ball. However, even on Formal evenings, more Elegant Casual attire is perfectly acceptable at certain alternative dining venues. FORMAL: Black tie or formal dark suit for gentlemen. Evening dress or other formal attire for ladies. Military or Award decorations may be worn on formal nights. A range of gentlemen’s formal wear is available to hire or purchase on board the ship. SEMI-FORMAL: Jacket and tie for gentlemen. Cocktail dress or trouser suit for ladies. No jeans. ELEGANT CASUAL: Jacket, no tie required for gentlemen. Dress, skirt or trousers for ladies. No jeans. On shore, you’ll want comfortable clothes for sightseeing. The type of clothes you bring depends on the itinerary. Even in warmer climates, it can get cold on deck, so some warmer clothes are always advised. It is advisable to bring a lightweight raincoat and umbrella, and you’ll want to make sure you have proper attire for visiting shrines, churches, mosques and temples (i.e., leg and shoulder coverings for both men and women). Animator's Palate is a Main Dining restaurant located on Deck 4, Aft aboard the Disney Magic and the Disney Wonder, and on Deck 3, Aft aboard the Disney Dream and the Disney Fantasy. Celebrating Disney animation, Animator's Palate includes an innovative dinner "show" starring your favorite Disney characters. Enchanted Garden is a Main Dining restaurant located on Deck 2, Midship aboard the Disney Dream and the Disney Fantasy that serves breakfast, lunch and dinner. Inspired by the picturesque gardens of Versailles, Enchanted Garden magically transforms from day to night during dining. Lumiere's is a Main Dining restaurant located on Deck 3, Midship on the Disney Magic that serves contemporary American cuisine for breakfast and lunch in a casual setting, and French-inspired continental cuisine amid a more refined atmosphere for dinner. The restaurant is elegantly themed after the hit Disney movie, Beauty and the Beast. Parrot Cay on the Disney Magic and the Disney Wonder is a Main Dining restaurant located on Deck 3, Aft. Inspired by the relaxed feel of the tropics, Parrot Cay boasts classic American fare for breakfast and lunch, and Caribbean island grill house specialties for dinner. Royal Court is a Main Dining restaurant located on Deck 3, Midship, aboard the Disney Fantasy that serves breakfast, lunch and dinner. Inspired by the classic Disney films Cinderella, Snow White and the Seven Dwarfs, Beauty and the Beast and Sleeping Beauty, the décor and atmosphere of Royal Court is especially beautiful. Triton's is a Main Dining restaurant located on Deck 3, Midship on the Disney Wonder that serves contemporary American fare for breakfast and lunch, and continental cuisine with a French flair amid a more elegant setting for dinner. The restaurant is themed after the hit Disney movie, The Little Mermaid. Beach Blanket Buffet on the Disney Wonder is an indoor/outdoor buffet restaurant located on Deck 9, Aft that serves classic American and international cuisine. During breakfast and lunch, Beach Blanket Buffet serves the finest in buffet dining; at dinnertime, Beach Blanket Buffet becomes a table-service restaurant offering many Main Dining delights. Grab a quick bite at Flo's Café, located near Donald's Pool on Deck 11, on both the Disney Dream and the Disney Fantasy. Choose from a variety of healthy options and hearty fare across 3 unique stations themed after characters from the Disney•Pixar film Cars. Goofy's Galley, a Quick Service restaurant located on Deck 9 on the Disney Magic and the Disney Wonder, is an outdoor eatery serving breakfast, lunch and evening snacks. Pinocchio's Pizzeria, a Quick Service restaurant located on Deck 9, Midship next to Goofy's Pool on the Disney Magic and the Disney Wonder, is an outdoor snack spot serving pizza throughout the day. Pluto's Dog House, a Quick Service restaurant located on Deck 9, Aft next to Mickey's Pool on the Disney Magic and the Disney Wonder, is a convenient snack bar that serves classic American fare like hamburgers and chicken for lunch and dinner. Preludes, a Quick Service restaurant located just outside the Walt Disney Theatre, is a snack stand on all the Disney ships serving beverages and snacks during live show performances and movies. Palo is an Adult Exclusive restaurant located on Deck 10, Aft aboard the Disney Magic and the Disney Wonder, and on Deck 12, Aft aboard the Disney Dream and the Disney Fantasy. The restaurant serves Northern Italian cuisine for dinner. Additionally, brunch is offered on select cruises. Remy is an intimate Adult Exclusive restaurant located on Deck 12, Aft aboard the Disney Dream and the Disney Fantasy. Offering the most upscale dining experience available onboard, the restaurant serves the finest in French-inspired cuisine for dinner. Breakfast and lunch are served in Parrot Cay and Lumiérés on the Disney Magic, Triton's and Parrot Cay on the Disney Wonder, and Royal Palace and Enchanted Garden on the Disney Dream. There are also buffets at Topsider Buffet on the Disney Magic and Beach Blanket Buffet on the Disney Wonder, as well as casual dining at Cabanas on the Disney Dream. Quick poolside meals are also available during breakfast and lunch. Check your Personal Navigator daily for specific hours of operation for all our great dining locations. On the Disney Wonder and the Disney Magic, the Main Seating is at approximately 6 p.m.; the Second seating is at approximately 8 p.m.
On the Disney Dream and the Disney Fantasy,the Main Seating is at approximately 6 p.m.; the Second seating is at approximately 8 p.m.
From a festive five-course affair to a quick, casual dinner for two, our As You Wish® dining lets you choose the venues and style that suit you. - Hot hors d’oeuvres during cocktail hour. Special dietary needs, such as vegetarian, diabetic or gluten-free meals, are easily accommodated with advance requests. Kosher meals and a Health Conscious Dining option are also available. To arrange special meals, please contact your travel agent at least 90 days prior to departure. As You Wish® dining is currently available on each of our ships on all cruises. Early breakfast is served on deck between 06.30 and 07.00. Breakfast is served in the restaurant from 07.00 until 09.30, at the on-deck buffet from 07.00 until 10.00, or in your cabin from 07.00 until 10.00 (except on the day of disembarkation). Cabin service can be requested using the form found in the cabin. Lunch is served from 12.00 until 14.30 in the restaurant and on-deck buffet. Dinner is served in the restaurants in two seatings at 19.00 and at 20.45. Times may change depending on dockings and excursions. Any changes will be indicated in the Daily Program. Special diets can be catered for if requested at the time of reservation. A supplementary charge may apply to these special requests. It is possible to reserve lunch and/or dinner at special and a la carte restaurants through the Reception Desk. Don't be misled by other cruise lines' dining 'options.' They really come down to some fast-food choices or one big dining hall where you often have to eat with strangers. NCL has a wide variety of actual restaurants with great, new signature dishes in every one. And, with up to 13 different restaurants and dining rooms on board, like Le Bistro, NCL's exclusive French bistro, and Cagney's, NCL's scrumptious steakhouse, you'll find something to satisfy your every craving, every night of your cruise. Freestyle Cruising is not too dressy, not too casual. We call it 'resort casual.' You'll call it being on vacation. By day, almost anything goes. Khakis, skirts, jeans, casual tops, shorts, or whatever are all fine. Casual is perfect in NCL's restaurants too. Even if you've just been at the pool and don't feel like changing, no worries. Swimwear with a cover-up is fine at the buffet and outdoor restaurant. At night, it's relaxed all over the ship. When you're ready for dinner, it's collared shirts and pants or nice jeans for guys. Slacks or jeans, dresses, skirts and tops are perfect for women. Kids 12 and under are welcome to wear nice shorts in NCL's restaurants whenever. If you want to dress up and add a little glamour when you dine out, feel free - we've reserved a restaurant just for that. And remember to pack a sweater - air conditioning can be chilly. Forget about those cafeteria lines. Our buffet has a huge salad bar and 'action stations' where you can get made-to-order specialties. Start your day with freshly squeezed juices, a Bloody Mary or a refreshing Bellini. Have meat carved exactly to your liking or choose your favorites to be thrown on the grill. Enjoy a pasta dish made with all of your favorite ingredients, then try sweet dessert crepes with fillings of your choice. You can even whet your appetite the day you board with a sampling of dishes from all of NCL's great restaurants, and, when you need a little boost or just a place to relax, head to the Java CafÃ© for delicious Lavazza coffee drinks and special desserts. Lobster lovers of the world will rejoice because NCL has lobster dishes every single night. And choose one night of your cruise for an absolute lobster feast. Reservations for the Polo Grill and Toscana are required, and may be made with the M'atre d'Hotel each day as listed in Oceania Currents. Reservations are accommodated on a first-come, first-served basis. Reservations are not needed for The Grand Dining Room, Tapas on the Terrace or Terrace Cafe. For the comfort and convenience of all Guests, the onboard ambiance is casual but elegant throughout the cruise and country club and resort-style attire is appropriate for both men and women. We do ask that Guests refrain from wearing shorts, jeans, t-shirts or tennis shoes for evening meals in all of the restaurants. Bathing suits without a cover-up should not be worn in any of the indoor restaurants. Attire ashore is recommended to be casual and comfortable and Oceania's place a particular emphasis on appropriate footwear, including good walking shoes and in some destinations, reef-walkers and beach sandals. Some tourist sites may require specific attire. Please consult with the Destination Services desk for more information. Oceania Cruises sails to more than 180 ports in Europe, China and the Far East, Australia, New Zealand, South America, Central America and the Caribbean. Featuring three intimate and elegant mid-sized ships, Regatta, Insignia and Nautica, the line will introduce two new mid-size Oceania-Class ships to its award-winning fleet by 2011. Oceania Cruises, with headquarters in Miami, Florida, is owned by Prestige Cruise Holdings, a subsidiary of Apollo Management L.P. Savvy and sophisticated readers of Travel+Leisure and Conde Nast Traveler regularly rank Oceania Cruises as one of the world's finest cruise lines. These prestigious awards reaffirm the line's unique brand positioning and leadership within the hospitality industry and place the line above the leading premium cruise lines and in the esteemed company of the world's most respected luxury brands. On an Oceania Cruise, you will enjoy the flexibility of four open seating restaurants; you dine when, where and with whom you choose. Tuxedos and gowns are never a requirement for dining so you can dress and enjoy the evening comfortably. Each cruise ship holds less than 700 guests, so with a staff of 400 on board, you are sure to enjoy highly personalized service. There's a sense of warmth and intimacy throughout, so the ambiance resembles that of a private country club-casual, yet elegant. Nowhere else is the French art de vivre - the art of living - more evident than in the sensory pleasures of Paul Gauguin's moveable feasts. Of course, at every meal select wines are generously poured, compliments of the house. All part of the legendary tasting and temptings that you'll encounter aboard the ship. Ask any former guest of Paul Gauguin . This is the finest food served in the South Seas. Breakfast can be delivered to your stateroom on request, or is available in the form of a buffet at the restaurant. Lunch is also buffet style, in the evening a sit-down "French-style" dinner is served. 24 hour room service is available. Please contact our Maitre d' regarding any special dietary needs. Welcome to an incredible dining experience that gives you the freedom to choose where, when, and with whom you wish to dine. Princess is the only cruise line to offer a choice of Traditional Dining - the classic cruise experience - or flexible, Anytime Dining. We also offer a variety of specialty restaurant options as well as multiple casual dining venues. Whichever dining options you choose, you'll enjoy great delectable menus. Simply let your travel agent know your preference when you book your cruise. A Culinary Heritage of Excellence in Food is the foundation upon which Princess' passion for modern classical cuisine is realized. Exceeding individual expectations, C.H.E.F. celebrates a Princess tradition of world-class chefs creating exceptional dishes - featuring specialties like premium grain-fed beef and cold-water Maine lobster. We've also introduced a Lotus Spa Cuisine selection into Princess' dinner menus, reflecting the perfect balance of nutrition and flavor. No matter where you dine, you'll find the highest quality cuisine throughout Princess' ships. Indulge in award-winning cuisine, served in an elegant, comfortable dining room each evening at 6 p.m. (first seating) or 8:15 p.m. (second seating). For passengers wanting more flexibility in their dining schedule. Just like in a restaurant, show up when you like between 5:30 p.m. and 10 p.m., to enjoy dinner alone or with friends. When it comes to gourmet fare, variety is the spice of life - so Princess offers several specialty dining options. Sterling Steakhouse is an upscale take on the traditional steakhouse, serving favorites like New York steak and rib eye. Sabatini's, Princess' Italian trattoria, is as authentic as they come - featuring fresh pasta dishes and Mediterranean seafood specialties. And the Bayou Cafe and Steakhouse will transport your tastebuds to Cajun country. Enjoy Ultimate Balcony Dining, featuring fresh lobster or steak, delicious delicacies and private service, all on your own balcony. Treat yourself to this unparalleled level of luxury morning or night, available for an additional cost. Indulge in afternoon tea with finger sandwiches, pastries, scones, cookies, music and white-glove service. It's the perfect interlude between sunning out on deck and a star-studded evening at sea. Enjoy a wide selection of premium teas - from Earl Grey to herbal infusions. And of course there's coffee, if you prefer. The choice is up to you. Call for personal room service at any time of the day or night. To have continental breakfast delivered to your stateroom, just fill out the breakfast card included in your stateroom portfolio (one is also placed on your pillow) and hang it out at night on your stateroom door. For a full stateroom menu, please see your stateroom portfolio or call the number listed in your onboard telephone directory. What could be more fun than throwing a party at sea? We'll arrange for the invitations, mix the cocktails, and pour the wine. Our chef will even prepare a selection of your favorite hors d'oeuvres. Just contact the Passenger Services/Purser's Desk to plan all the details. To enhance your dining experience, Princess has established a smoke-free dining policy. For your convenience, Princess offers other smoking areas throughout the ship. During your cruise, you will meet staff throughout the ship who provide you with excellent service. Many more crew support those who serve you directly. To save you the worry of who to tip and how much, Princess makes it easier for you to reward excellent service by automatically adding a discretionary Hotel and Dining charge of $11 USD for suites and mini-suites and $10.50 USD for all other staterooms per person per day (including children) to your shipboard account on a daily basis. This charge will be shared amongst those staff who help provide and support your cruise experience, including the wait staff, stateroom stewards, buffet stewards, galley staff, laundry staff and others. A 15% gratuity is added to bar charges and dining room wine accounts. This is shared amongst the beverage staff and their support staff, including cleaners and utility staff. We know you will find the services onboard exemplary. A cover charge of $15 to $25 per person may apply at Princess' alternative dining venues. Prices may vary or change without notice. Passengers under 21 years of age are not permitted to purchase or consume alcohol onboard. Duty- and tax-free alcohol is available for purchase and may be delivered to your stateroom the last day of your cruise. Discounted stateroom packages are available. Alcohol purchased at any port of call, including the port of embarkation, may not be consumed onboard. It will be collected at the gangway for safekeeping and delivered to your stateroom on the last day of your cruise, prior to your disembarkation. You may bring wine or champagne onboard to celebrate special occasions (limit: one bottle per person). If consumed in the dining rooms or alternative restaurants, each bottle will be subject to a $15 corkage fee*. There are four open-seating main restaurants plus the Pool Grill - a surprising number for a ship of her size! Waiters recruited from some of the world's finest restaurants and hotels provide Regent's renowned 'Above and Beyond' service. A choice of fine, complimentary wine is poured nightly, or a professional sommelier will be pleased to discuss alternatives available for purchase from the Seven Seas Voyager's wine cellar. And if you prefer to dine en suite, you may order selections from the chef's nightly menu during regular dining hours - while the room service menu is available 24 hours a day. You're going to need some serious energy food for all the activities and excursions on a Royal Caribbean cruise. And whether you're hungering for a quick snack or an elegant dinner, we've got you covered! Enjoy a warm, full meal for breakfast and a multi-course feast for dinner in the Main Dining Room. Options abound in the Windjammer Cafe - perfect for a quick lunch or a casual meal. Our Specialty Restaurants - like Chops Grille or Portofino - offer amazing food in a restaurant atmosphere. If you've got a sweet tooth, grab a scoop at Ben & Jerry's or a creamy shake at Johnny Rockets - RCCL's lively onboard diner. Meals from many onboard venues, such as the Main Dining Room and Windjammer Cafe, are included in the price of your cruise. There is a $20.00 USD per person service charge to dine at the Portofino Restaurant and a $25.00 USD per person service charge for Chops Grille. To dine in Johnny Rockets, there is a $4.95 USD per person service charge. All prices subject to change. We offer a soda package for both kids and adults on every ship in RCCL's fleet. To purchase one, just visit any of RCCL's onboard bars or lounges. Lactose-free/soy milk, Ensure, and kosher meals are available no extra charge. All you have to do is notify RCCL at least 45 days prior to sailing (90 days for European/South American Itineraries). Contact your travel agent or Certified Vacation Planner and request that the remark be noted in your reservation details. If you made your reservation online at royalcaribbean.com you may add your request to the "update personal information." section. You may also send an e-mail request to [email protected]; please include in the e-mail the guests' names, booking number, ship name and sail date. E-mails will receive an automated response. We kindly ask that guests do not call Royal Caribbean International suppliers with specific questions. Special meal requests that are received less than 45 days of sailing (90 days for European/South American itineraries) are dependent on the ship's product availability. We will try to accommodate to the best of RCCL's ability. Please note: Baby food is available via RCCL Gifts and Gear page via RCCL Babies To Go program and infant formula is not provided on board. Seabourn knows that guests understand fine dining. And celebrated Chef Charlie Palmer delivers on all levels; with an innovative menu that fills the senses with wonder. From traditional fine dining in Seabourns open-seating Restaurant and an eclectic and adventurous menu in Restaurant 2 to themed dining in The Colonnade and more casual fare in the Patio Grill, Seabourns acclaimed made-to-order dining experience is enhanced by Seabourn's personal custom of welcoming you like an honored guest â€“ whose preferences are carefully noted, then thoughtfully indulged every night. Perhaps that's why Seabourn has been honored with the prestigious International Five Star Diamond Award for the last 13 years and was ranked Top Cruise Line Food in Conde Nast Traveler's 2007 Reader's Poll. Seabourn yachting life offers you a choice of up to five dining venues. Enjoy breakfast, lunch or dinner in one of Seabourn's traditional restaurants. Dine on deck in one of Seabourn's al fresco eateries, or at your request, you can have dinner from The Restaurant served course-by-course in your suite, complete with white linens, fine china and silver service. Don't miss special culinary events like Shopping with the Chef at local markets in select ports around the world. Learn from the masters of the Chef's Circle as guest chefs from well-known restaurants share their culinary secrets. Enjoy tempting treats and rare estate teas, compliments of Seabourn's popular Seabourn to a Tea, complete with white glove service and relaxing, live music. No matter what your dining pleasure, Seabourn's award-winning staff is there for you - when you want... with what you want. Day after day, night after night, fine dining, superb oceanviews and the freedom of open-seating dining come together in a fusion sublime and extraordinary. Savour decadent cuisine inspired by the internationally acclaimed Grand Chefs of Relais & Chateaux the prestigious association of exquisite boutique hotels and restaurants. Three beautiful, intimate dining venues invite you to meet with new friends, plan a quiet evening for two, or gather in celebration of that special occasion. Each providing the relaxed ease of a single seating, and the flexibility to arrive at your leisure and dine with friends of your choice. The Restaurant encircles its guests with sophisticated elegance and impeccable service. Each evening, contemporary, international cuisine is created by Silversea's talented chefs and enhanced by "La Collection du Monde", a series of signature dishes created exclusively for Silversea by Relais & Chateaux. Or opt for a divine selection of Italy's best cuisine served a la carte in La Terrazza. Authentic recipes and the freshest ingredients come together with flair and passion - a flavourful expression of Silversea's distinctive heritage. The only Wine Restaurant by Relais & Chateaux at sea can be found aboard the ships of Silversea. Indulge in an evening where fine wines are complemented by a set tasting menu of regionally inspired dishes. An extraordinary six-course experience celebrating the world's most distinguished wine regions. Sister restaurants Saletta (Silver Cloud and Silver Wind) and Le Champagne (Silver Shadow and Silver Whisper) foster a cozy ambience perfectly suited for private dinner parties. Enjoy fresh, casual fare on deck in the open air - sunshine or shade. IN-SUITE DINING A savoury mid-day snack, a sweet late-night whim or a meal served course-by-course in the privacy of your suite. In-suite dining and 24-hour room service are always an option and always complimentary. FINEST WINE CELLAR AT SEA An extensive selection of complimentary red and white wine pairings are suggested with lunch and dinner entres. Premium wines are offered by the bottle at an additional charge. Star Clippers' inspired chefs make dining aboard a delightful culinary adventure with an international menu of foods from the far corners of the earth. When you rise, help yourself to a continental breakfast with Parisian croissants, toasted English muffins or sweet Danish pastries, or savor a full breakfast with fresh tropical fruits and crisp bacon, grilled sausage, smoked salmon and omelets cooked to order in the dining room. When evening comes, Star Clippers' elegantly appointed dining room becomes the setting for the chef's finest culinary presentations, designed to please the eye and the palate, complimented by a selection of equally fine wines. You'll find Star Clippers' service to be friendly and gracious, as befits a tasteful restaurant. Of course, Star Clippers' would not presume to dictate your seating preferences. At lunch, a marvelous buffet of seafood, salads and grilled favorites awaits your pleasure. If the day includes a stop at one of the paradisaical islands Star Clippers' frequent, you might also be treated to a succulent outdoor barbecue on shore. On all three ships, you are free to dine when and with whomever you wish, including Star Clippers' officers, who join Star Clippers' guests in the dining room most nights. With diverse locations to choose from, every dining area on Viking Star has been carefully considered. Viking Star's crown jewel is The Restaurant, with the widest choice of culinary offerings. You'll want to return again and again because Viking created a daily-changing menu highlighting local cuisine so you can explore regional specialties. Your menu is ever evolving to reflect the seasons, your destinations, and locally sourced ingredients. But you have other options as well. Perhaps one night reserve an intimate experience at The Chef's Table for a specially prepared tasting menu complete with wine pairings. Or make a reservation for the Tuscan experience of The Italian Grill to try antipasti; the perfect locally inspired pasta or a steak in the legendary Florentine tradition. Wherever you find yourself on board, Viking's dining rooms offer menus that incorporate ingredients freshly gathered from local markets, and an authentic local feeling. And of course, Viking Concierge is always on hand to recommend a great local restaurant. But there's even more dining choices: on Viking Star you have options beyond our traditional restaurants. Indulge in Scandinavia specialties at the Viking Deli in the Explorers' Lounge, surrounded by two-story ocean views. When travel whets your appetite, visit the World Café where a wide variety of cravings can be fulfilled. Like Viking Star herself, choice is the theme of the day - from American classics to Chinese to sushi or continental European favorites. Here you can choose from a variety of freshly prepared dishes or meats hand-carved to order, and watch the chefs at work. Dine al fresco on a warm summer night, or inside on a cooler day - surrounded by fantastic views. For a change of pace, since part of your journey is about expanding your horizons, don't forget to try Viking's onboard cooking school and intimate restaurant, The Kitchen Table. And for those times when you would rather unplug in your comfortable stateroom and just relax, there's no-fee room service. So, throughout the ship you will find casual dining options to fit your every mood, from high tea at the Wintergarden or seafood at the al fresco Aquavit Terrace - the choice is yours. It is 7:30 in the morning. You awake to hear the gentle trade winds filling the sails. The smell of freshly-brewed Colombian coffee and buttery croissants lures you topside to the Veranda. It's breakfast al fresco, full service or buffet-style, anytime till 9:30. No need to hurry. Or if you prefer, linger over a continental breakfast served in the privacy of your stateroom. Whichever is fine with us. After all, this is what the good life is all about: doing what you please, when you please. Lunch Again, the choices are many in the Veranda. Choose the sumptuous, seemingly endless buffet. Or, order from the lunch menu. Dinner In the evening, Windstar turns the spotlight to our elegant, wood-paneled restaurant. Here, the dining room manager seats you, but where is your decision. There are no preassigned tables or first or second seating. When you dine and with whom are entirely up to you. (Seating usually begins at 7:30 p.m. and will be printed in the ship's daily program.) On the Wind Surf, you can enjoy the lively Degrees, featuring special themed dinners like Italian, Indonesian, Steak House and an eclectic choice of wines. The evening attire onboard Windstar is specified as 'casual elegance'- the emphasis weighted heavily on the former. The cuisine is exquisite ... a unique creation of light and savory entrees using fresh native food and tropical accents. What will it be? Pear and goat cheese salad with prosciutto? Roasted eggplant and garlic soup? Grilled ahi tuna with Asian vegetables and a ginger pink peppercorn sauce? Or perhaps a mocha and chocolate terrine with almond sauce? To all this, Windstar adds a fine selection of vintage wines. Windstar offers Sail light and vegetarian recipes, specially created by our Chefs on board. In addition, our Executive Chef on board is available to help you choose light fare upon request. Low-sodium diet, vegetarian, low-cholesterol, salt or fat free and other special dietary needs can be accommodated if Windstar is notified in advance. Our dining room staff will be happy to oblige your special needs. Just let us know your dietary preferences at the time of booking, and reconfirm with the dining room manager once you're aboard. Windstar shall do our utmost to fulfill all requests, although agricultural and perish ability restrictions may apply. (Please note: Special requests received less than 30 days before sailing may not be available.) Kosher meals are not available. If you (or your travel agent) requested special meals at the time of your booking, please reconfirm this request with the Maitre d' after you board. If you have further questions or require additional information, please contact the Ship Services Department. Bottles or other containers of beer and other alcoholic beverages purchased in the vessel's shops or otherwise brought on the ship cannot be consumed on the ship, with the exception of wine and champagne. If the beverages are purchased from the vessel's shops or at ports of call, they will be collected for safekeeping and delivered to your stateroom on the last day of the voyage. Our staff will make arrangements to store the items for you during the cruise. Guests can bring wines and champagne purchased from outside the ship onboard for consumption in their stateroom. For consumption in the restaurants or bars, a $15 corkage fee will be applied to the guests onboard account. Room Service Complimentary room service is available 24 hours a day for sandwiches, selected canapes, coffee and tea.